DALLAS — More than two decades after President George H.W. Bush took his campaign for president on the tracks, 41 will ride again one last time Thursday. 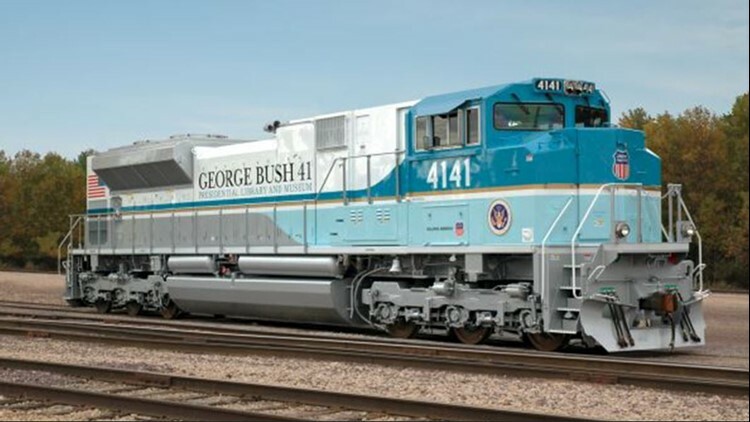 "Wow," said Bush in 2005 when he first laid eyes on the Union Pacific's Locomotive No. 4141, which was re-designed in his honor and emblazoned with his name followed by the number 41. Painted in shades of blue and gray in a nod to Air Force One, the locomotive was pulled from service and put into storage in 2012. In 2018, it has a new purpose—to carry the late president to his final stop, College Station, Texas, where he'll be laid to rest at The George H.W. Bush Presidential Library. 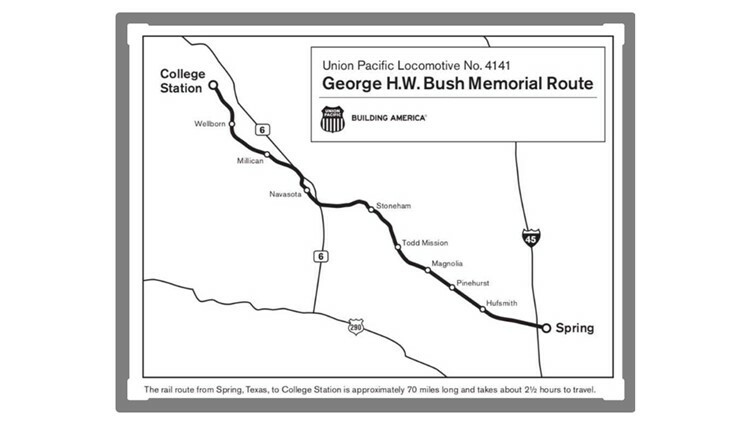 The locomotive, along with 10 passenger cars, will carry the late president and family members on a journey that will begin Thursday in Spring, Texas, north of Houston, and wind up northwest for 70 miles through eight small Texas towns. The journey is fitting for a man who once said of 4141, "If I had one of these when I was president, I might have left Air Force One behind." Back in 2005, when the locomotive was unveiled, Bush told the Associated Press that it brought back memories from his childhood of "sleeping on trains when he traveled with his family." But Bush also has another history with trains—a Truman-style whistle stop tour during his 1992 presidential campaign. While Bush lost his '92 bid for re-election to Bill Clinton, the image of him standing with his shirt sleeves rolled up as he spoke enthusiastically from the platform of a train is still remembered by many. Thursday will bring back those days when the sound of a train whistle lured large crowds to Bush's presence.  While the train won't stop until it reaches its destination, it will slow down as it travels through each town. Following a funeral service at St. Martin's Episcopal Church in Houston, Locomotive No. 4141 will depart at 1 p.m. from the Union Pacific's Westfield Auto Facility, which is closed to the public. It's estimated the train will take about two hours and 25 minutes for the train to reach College Station.